Now that spring is in full bloom, it got me thinking about bees. Bees are incredibly helpful creatures; without these pollinators, as much as one-third of the food we eat wouldn't grow. When you look at the growth of the medical imaging ecosystem, it seems as though something similar is happening with artificial intelligence and enterprise imaging. Allow me to explain. 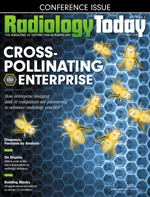 As Jeannette Sabatini reports in our cover feature, AI algorithms that can identify numerous medical conditions are springing up everywhere, but a key sticking point is how to incorporate them into radiologists' workflows. With time already at a premium, most radiologists can't afford to add a step or two to their workflow, no matter how well an algorithm can spot a specific medical condition. Another issue is that AI algorithms need large data sets in order to be "trained." By partnering with enterprise imaging companies, AI companies are getting access to large reservoirs of data. In return, enterprise imaging companies can offer these algorithms to their customers and, in many cases, help them integrate these tools into their existing workflows. This cross-pollination will allow AI companies and enterprise imaging companies to grow beyond their current borders. Speaking of workflow, Beth W. Orenstein takes a deeper dive into how AI is being incorporated into CT workflow. Although still in the early stages, several companies are targeting CT because it is often used to identify urgent medical conditions. Since the FDA has designated AI tools as Class 2 medical devices, there may be a proliferation of AI algorithms for CT in the near future. On the other end of the spectrum, while AI algorithms have shown a lot of promise for quantifying medical conditions, one realm of practice that has stubbornly resisted quantification is the value of imaging. Dan Harvey looks at radiology's value proposition, and there doesn't seem to be a consensus about what to measure, let alone how to measure it. What's your definition of value, and how can you demonstrate it? The answers to those questions will go a long way toward defining radiology's role in the value-based era. Also in this issue, Keith Loria details the latest and greatest developments in medical displays. A few years ago, some radiologists were switching to, or at least considering, consumer-grade monitors as replacements for their old equipment. Those who waited are probably glad they did. Today's monitors have incorporated the best from consumer electronics and upped the ante, with advances in lighting, contrast, and ergonomics.